My reaction to this issue is, quite simply: HAHAHAHA! And a tip of the hat for a gutsy move. 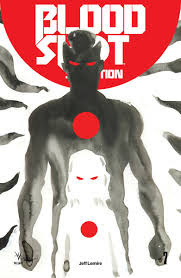 The issue finds the hero Bloodshot trying something desperate to save the life of his young daughter: he carries her over to the dimension known as Deadside. It's a trip loaded with peril, especially since, upon arriving, the hero finds he is blind. So, of course, each page is back, only illuminated by word balloons and sound effects. So yes, most of the issue features black pages - and word balloons. It's the opposite of the old John Byrne / Alpha Flight "polar bear in a blizzard" gag - this issue has pages and pages of black.. It's an interesting device, and the story is pretty compelling - but I suspect ,, to anyone who paid full cover price, it may seem to be a gag too far. Hilarious. I have an older comic around here as well (I forget the title), but it is all drawn as a series of dots (as characters) with word balloons. Evidently it's conceptually done, but lacking in the artwork.